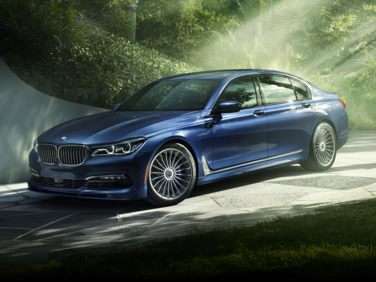 The BMW Alpina B7 is the ultra performance version of BMW’s flagship 7 Series sedan. While the M division of BMW has been allowed to put its own distinctive and highly incendiary spin on just about every other gasoline-fueled BMW, the 7 Series has yet to be “M-deminfied”—sort of. In the case of the 7 Series, the longtime BMW aftermarket-tuning firm Alpina was granted an opportunity to elevate the already lofty performance potential of the luxury saloon. It ahs been said the powers-that-be at BMW felt the high revving engine/sequential manual gearbox treatment favored by the M division was a bit too undignified for its executive class saloon. Plus, it was argued if the 7 Series buyer truly wanted more power and performance they already had access to BMW’s V12 engine with the 7 Series, which could not be said of the other models in the BMW lineup. So instead of creating an M7, the product planning team allowed Alpina Burkhard Bovensiepen GmbH to do a higher performing version of the 7 Series car—and thus the BMW Alpina B7 was born. To accomplish the task, the engineers at Alpina fitted the 7 Series with a 21” set of wheels and tires, a more aggressive suspension setup, bigger brakes, and of course more engine. As this is written, we are currently in the second generation of BMW Alpina B7 models. The first version of the car (2007 – 2008) ran a radial supercharger with BMW’s 4.4-liter V8 to produce 500 horsepower and 516 ft-lbs of torque. This is quite remarkable when you consider the engine developed 325 horsepower and 330 ft-lbs in its stock configuration. Power transmission to the rear wheels was accomplished through a six-speed automatic gearbox with a manual shift function. The current iteration of the Alpina B7 also makes 500 horsepower and 516 ft-lbs of torque. However, the 4.4-liter V8 was already twin-turbocharged, so Alpina fitted a larger set of turbochargers to get there rather than the radial supercharging strategy of which its predecessor made such good use. A six-speed automatic, just as with the previous iteration of the car handles transmission duties, again with manual shift capability. In addition to the engine and suspension modifications, a specific aero kit featuring a unique airdam and rear spoiler distinguishes Alpina B7 cars. The interior uses Alpina –specific wood trim, and blue-faced instrumentation with red needles. Further, and quite counter intuitively; the steering wheel is actually more slender than on the standard 7 Series car, although it is upholstered in a better grade of leather.